A Sindhi writer and scholar examines the manifold relationships between Indus artifacts and elements of Sindhi culture that still exist or did so in the near past; she also speculates on how Indus religious traditions – like the stupa crowning the ruins of Mohenjo-daro – may have survived in later Buddhist and Jain traditions. A wide-ranging discussion that brings up a lot of issues and possible connections and points the way for further research into pre- and post- Indus practices, words and beliefs. Her emphasis on trying to find surviving threads of Indus culture in contemporary Sindh is fertile ground for investigation; she quotes the writer N.A. Baloch: "Even if we were to presume that the language of the Indus civilization had died away as a spoken language like Sumerian, Assyrian, Sanskrit, Latin and others, it must have left behind some words, names of persons and their castes or ethnic groups, names of trees, plants, herbs and shrubs, animals, household goods, and building materials. There is a possibility that some of the words used by people of the Indus Civilization could still be prevalent among the inhabitants f the remote areas of Sindh where external influences have not been in abundance." (p. 127). “Indus Seals (2600-1900 BCE) Beyond Geometry: A New Approach to Break an Old Code” is a pioneering work which draws attention to the languages and culture of the Indus region for a better understanding of its ancient Indus seals. The signs and symbols inscribed on the seals are considered to be an ancient script which is yet to be deciphered. However, the seals are also imbued with images of animals, humans, deities, trees and unidentifiable objects. Hence, apart from depicting the script they also symbolize an assortment of social, cultural and ideological content which requires a holistic approach for its interpretation. This book looks for clues in three latent sources to establish the socio-cultural context of the seal images: it seeks ancient words retained in the Sindhi language and relates them to the seal images; it highlights the symbols of Buddhism, Jainism and Hinduism on the seals and traces the roots of the philosophy of nonviolence in ancient Indus cities; and it examines the geometric principles and patterns of seals to study the significance of geometry in the Indus Civilization. The book, through a few examples, demonstrates that these seemingly diverse means can eventually converge to present a clearer picture of a small fraction of the seal iconography. Hence, the book also emphasizes to explore more sources to understand the multiple facets of the seals. 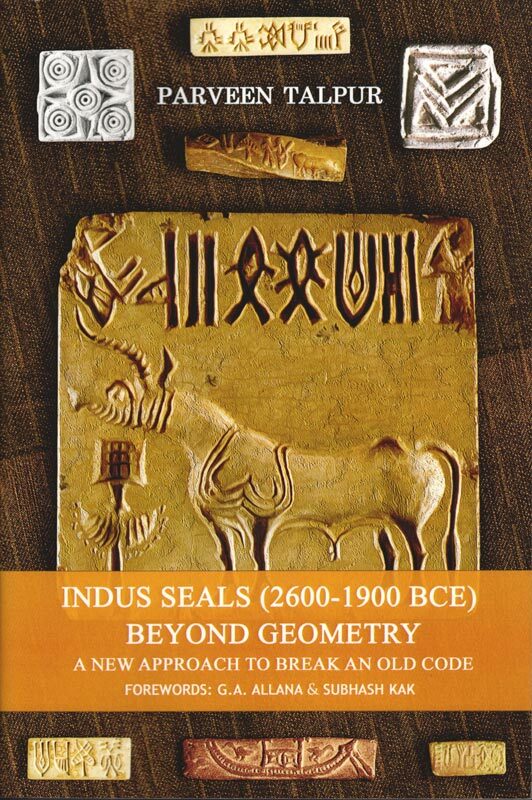 “Indus Seals (2600-1900 BCE) Beyond Geometry: A New Approach to Break an Old Code” is Talpur’s third book on the Indus Civilization. It is a companion to her last book “Moen jo Daro: Metropolis of the Indus Civilization (2600-1900 BCE)” and it is an update to her previous research covered in “Evidence of Geometry in Indus Valley Civilization,” her first book on this subject.